My original plan was to pilfer the two 36″ nylon parachutes from my never flown Sparrow rocket for recovery. 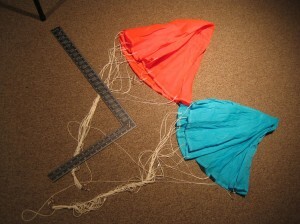 However after feeling the weight of the new bird I’m starting to think I might need some beefier chutes. Also need to track down some heavy-duty shock cord to absorb the ejection charge. One of the things that the original rocket had a problem with was that the nose would “bang” against the body during descent and do some surface damage to the fins and body tube. I could have the nose and body recover separately but I think some adjustments to the position of the chutes along the shock cord can cure this problem. Have to work on recovery stuff a bit….also need to decide on launch guidance. This one is a little large for a standard rod/lug system so I’m looking into a rail-guide. Need to do a little more research on this.